Inmates is an entry in a long list of story-driven psychological horror games and hopes to stand out from the competition with it's "mind-bending" puzzles. Is it the next Silent Hill, or should it be locked up? Captivating story and decent environments. Good audio quality and interesting concepts for a game of this genre. Slow movement speed and sparse puzzles can make this game feel more like an empty walking simulator than a true psychological horror/puzzle game. Inmates is a really cool concept buried in sometimes agonizingly slow gameplay that can leave the player unsatisfied. This game would have been markedly better if they didn't advertise "mind bending puzzles." The game is short, but that may be more of a blessing than a curse. I simply cannot envision paying more than $3 for this game. I want very much to like it, but good ideas ultimately can't save a bad player experience. The game seems to have seven puzzles overall. One of them was a maze, two of them were not plot relevant and yield no reward, and only one is particularly challenging. The only puzzle that approached a status resembling "mind bending" involves a dream sequence in which the player character floats around a library that would make M.C. Escher proud, though the puzzle itself was not actually difficult plus the terrible controls and trippy environment left me with a headache. The game's description, to my mind, drew parallels to the Silent Hill games. Though it would be beyond unfair to compare a small time developer to one of the most iconic psychological horror/puzzle series ever made, it certainly didn't make up for the letdown of the puzzle aspect of Inmates. The best I can say is that the game had potential, and perhaps non-main story puzzles could have been better utilized to provide the player with better knowledge of the story, or rewarded the player in any way at all. The story is by far the best part of this game, although not all it could have been. The plot revolves around the player character waking up in a seemingly abandoned prison and setting off from his cell (almost all the cells are unlocked; so much for security) to figure out why he's there. The story is told almost entirely through radio conversations with someone named Ben. Perhaps the biggest gripe I have is that the developers did not heed the advice of "show, don't tell." The reason the story has a rating as high as it does is because I found the ending to be very unique, handling topics of mental health - Dissociative Identity Disorder in particular - in a way I have not yet seen. It is ultimately a bit silly, but it did not detract from the experience much. I won't spoil, but the resolution does make the player feel a bit better about the road to the end of the game. As an aside irrelevant to the story, the game has a very pseudo-intellectual thing going on with some of the notes the character can collect. Many of them say effectively nothing in highly philosophical or scientific terms, and it comes off as pompous. Gameplay is the biggest weakness. The character moves at a positively sluggish pace, which I first attributed to the player character's complaints of a headache. This feels acceptable during the initial exploration of the prison block the player begins on, as the focus is more on seeing what each cell contains and looking for goodies. 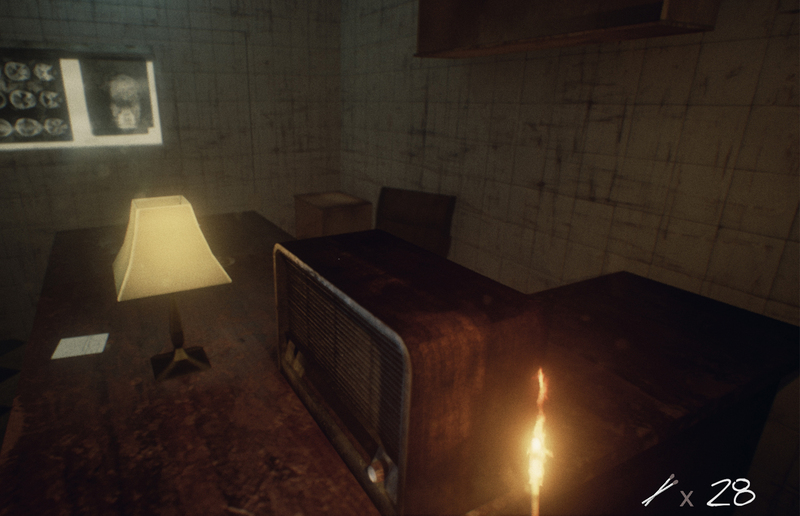 The main gameplay mechanic is the use of matches, which can be found scattered around the prison and used to briefly light up the area. The matches, however, are in a ridiculously abundant supply, so unless the player is playing with almost no brightness, one will have far more matches than are needed (I ended with upwards of 50 after starting to use them liberally). Ultimately, the matches do more to obscure your vision than to aid it, and are only bearable when the room is otherwise pitch black. Exploration is very unsatisfying; the cells are lined with writings of coordinates, cryptic phrases, astrological symbols, and more, but it quickly becomes clear that none of them bear any relevance to the greater story. Overall, it felt like some kind of punishment to actually play the game. The name of the game is "slow" with Inmates. I had the distinct misfortune of plugging in a controller as soon as I saw it was supported. When the control stick still moved the cursor around the screen at a snail's speed, I optimistically turned up the sensitivity. This accomplished nothing. The experience of the menu alone should have prepared me for the game itself. Though the controls are simple and straightforward, they seem unresponsive at times. Countless times, I needed to click on a door upwards of three times for it to open. Combined with the movement speed that made me wish I could push the control stick into oblivion, Inmates is very clunky and a pain to play. Even after switching to mouse and keyboard, I found no respite. An abandoned incarceration center is nothing new to the horror genre (most games use an insane asylum, though Inmates used a prison). The cell blocks were bland and it felt as though there was never a reason to look toward the exterior walls of the prison. There seemed to be nothing to find anywhere but in the cells and offices, and thus the player's attention is always inward. As previously mentioned, there is an abundance of ultimately useless information scrawled on the walls of almost every cell, as well as many books on topics ranging from theoretical physics to philosophy to religion. That said, some neat looking shrines and the initial viewings of the wall writing did much to pique my interest and excite me for the rest of the game. I tend to not expect much from indie horror games graphically, as they all seem to have the same general feeling and level of detail, not too pretty, but not awful. This game did not exceed my standard, nor did it disappoint tremendously. Unity engine graphics are almost always passable, if not ideal. I like to end on a positive note. The sound design of the game was very good, especially compared to just about everything else. There are few voices in the game, but those that are present are of decent quality. The voiced protagonist presents his lines well, with only a little awkwardness here and there. It was nice to have voiced characters that did not seem to be recorded on a microphone buried in mashed potatoes. The ambiance was acceptable, and one of the few contributors to a genuinely spooky feel.